Home »The Bigger Picture»Maurice Strong- Godfather of Crestone/Baca: “Father Earth/Savior of the Planet,” World-Class Robber Baron, and/or U.N. Globalist/Environmental Con-man? Maurice Strong- Godfather of Crestone/Baca: “Father Earth/Savior of the Planet,” World-Class Robber Baron, and/or U.N. Globalist/Environmental Con-man? Appendix 2. Maurice strong- Godfather of Crestone/Baca: “Father Earth”/”Savior of the Planet,” World-class Robber Baron, and or Globalist Enviro-Con Man Extraordinaire? ETK Introduction: Crestone/Baca’s current identity as “sustainable,” interfaith spiritual community (and more?) is largely attributable to two foreigners; the Canadian, Maurice Strong, and his Danish wife, Hanne. In order to understand much of what is happening in Crestone, Colorado today, it is important to understand the amazing and enigmatic career of Maurice Strong. Certainly, much of Crestone/Baca’s ideology/mythology regarding sustainability, global warming, New Age (Gaia) spirituality, etc. is directly related to the 1992 U.N. Rio Earth Summit, for which Maurice Strong was Secretary General. The following oft-quoted statement by Strong should send shivers up the back and neck of any thinking American citizen, especially when they realize how powerful and well-connected to the world’s ruling elite this man was. … Advertised as the World’s Greatest Summit, Rio was publicly described as a global negotiation to reconcile the need for environmental protection with the need for economic growth. The cognoscenti understood that there were other, deeper goals. These involved the shift of national regulatory powers to vast regional authorities; the opening of all remaining closed national economies to multinational interests; the strengthening of decision making structures far above and far below the grasp of newly minted national democracies; and above all, the integration of the Soviet and Chinese empires into the global market system. There was no name for this very grand agenda that I had heard anyone use, so later I named it myself- the Global Governance Agenda. … in 1991, I was just starting to see this big picture. I was no longer beguiled by the surface of things. I had also come to a kind of despair: I no longer believed that helping Paiakan or the environmental groups around him would improve the air my children breath and the water they drink. Local environmental conditions continued to get worse…. Yet breathable air and drinkable water did not claim the centre of the environmental debate. One heard constantly about global ozone depletion, climate change, the megadeaths of species in distant forests, wilderness parks… One heard mainly of fearful things beyond the reach of any single jurisdiction: they were shuffled around like props in a cheap diorama…. People I spoke to seemed to worry more about things beyond their governor’s control than about what was being dumped in their own sewers. A whole generation of believers in the climate crisis was being groomed in the schools: my children came home certain that the climate had already changed from good to bad, and the sun was no longer safe to play under. They were not told that they were repeating hypotheses, not facts, that these hypotheses were drawn from models made from inadequate observation, that some of the models might well be inadequate in themselves, or have been found to be inadequate. In short, local problems had been decoupled from the debate about environment and grand phenomena had been hooked to local political ends. Decisions about land use are always political decisions… The shifting argument about which areas had to be protected to protect us all from a climate crisis reinforced the emerging Agenda ideology that nation states cannot regulate effectively for the planet. The increasingly successful fusion of an ephemeral, ill-defined spirituality, often hastily borrowed from native peoples, with environmental science bothered me as well. It seems to me that the purpose of this fusion was to silence debate. Shaky science and attendant global management proposals could be pulled into the realm of the unquestionable once wrapped in the penumbra of sanctity. Critics could be attacked in their character. This is why religious belief and democratic politics don’t mix well. Democracy requires continual and creative compromise: religious belief cannot be compromised. The more leaders in nongovernmental organizations wrapped themselves in spirituality, the more suspicious I became about their commitment to democracy. I was also beginning to think I understood why fear about transnational environmental phenomena played a large role in the Agenda. How do you persuade democrats to give up sovereign national powers to govern themselves? How do you make them hand over power to supranational institutions they cannot affect, control, or remove? You make it seem as if this will serve their best interests. You terrify them with the grave dangers national governments cannot protect them from. I had started to assemble facts into patterns and to recognize patterns that recurred. I had recognized a pattern to the ideas presented to me: I had also spotted patterns of behavior. For example, I knew that what was said to be driven from the bottom up, from the grassroots, was actually being driven from the top down. I had come to this conclusion by following the inter-connections among the NGO’s active on the Agenda. Many of the NGOs shaping this environmental debate were connected, like pearls on a thread. A central figure in all of these organizations was Maurice Strong, the secretary general of the Rio Summit…. He played a large role in selling the world on the Global Governance Agenda. How had he come to be such a central figure? Whose interests did he represent? Strong’s staff had sent me his curriculum vitae. His tower of hats made Elizabeth May’s look pathetic. He listed so many businesses, honors, and NGO involvements, it was impossible to understand how one man could do so much. At first his curriculum vitae also struck me as odd, as if it was designed to sell a life, not as if a life had produced the document. When I had checked it and reviewed it, it also seemed to mirror the patterns of the Global Governance Agenda- NGOs, governments, politicians, native peoples, Marxists, Maoists, and democrats tied in knots with power companies and other great trade empires. His cv was a record of a lifetime of arrangements. He was born in Oak Lake Manitoba, in 1929, had only a grade 11 formal education, but had been granted 27 honorary degrees from universities around the world. (The latest count is 35.) He had combined private, public and non-profit ventures at several points in his career, giving rise to questions about conflicts of interest, but as one of his protégés, the writer John Ralston Saul, like to put it, there was nothing in this that would have startled anyone in the U.S. establishment. That master of the golden brain, John J. McCloy, the man biographer Kai Bird credits with the creation of the national security apparatus of the U.S., had done such things for almost a century. Many of Strong’s non-profit associates were also participants in the Agenda, either as advocates or as funders of advocates. Strong had been a trustee of the Rockefeller Foundation; a director of the International Union for the Conservation of Nature and Natural Resources in Gland, Switzerland, a director and vice-president of the World Wide Fund for Nature in Switzerland; a director of the Beijer Institute of the Swedish Academy of Sciences (now a separate NGO called the International Institute for Environmental Technology and Management); the Aspen Institute; the Bretton Woods Committee of Washington, D.C. He’d been on that particular board since April, 1985. The Bretton Woods Committee was formed to promote the virtues of the international development banks after Bramble, Rich, et al. came close to beating a U.S. administration-backed appropriations vote in 1984. Strong had also worked with the YMCA; the Vatican’s Society for Development, Justice and Peace; the North/South Institute; the Club of Rome; the Interaction Policy Board. Perhaps the most important, he was chair of the World Economic Forum. Strong had received his share of awards. He was a member of the Royal Society of Great Britain; the Royal Society of Canada; he’d won a Mellon Award; a Pearson Peace Medal; an Order of Canada; the Henri Pittier Order (from Venezuela); a Commander of the Order of the Golden Ark (the Netherlands). He became a member of the U.N. Environmental Program’s Global 500 in 1987. Those in the know said he also deserved a prize for crafting the world’s greatest human network. Many of Strong’s friends, said his friend Senator Jack Austin, were also hubs of networks in their own right. The cv also showed Strong’s meteoric rise, starting with his first job as an apprentice fur trader to the Hudson Bay Company back in 1945. But he was best known for his government service. He created the Canadian International Development Agency, CIDA. He had been one of Canada’s representatives on various development banks. He had chaired the board of the federal government’s International Research Centre, IDRC. He had set up Canada’s national petroleum company, Petro-Canada; he had chaired the Canadian Development Investment Corporation. He became both an undersecretary general at the United Nations and the secretary general of the Stockholm Conference on the Human Environment. He was the first executive director of the United Nations Energy Program. He ran the office of the African Emergency for the U.N. Development Program, which dealt with African famine. He was a member of the Bruntland Commission. We had agreed that I would come to Geneva to see him in time for the third preparatory meeting for the Rio Earth Summit. The national delegations were supposed to negotiate the fine points of the international conventions Strong’s staff had drafted on forestry, climate change, biodiversity, an Earth Charter, and a document Strong called Agenda 21. Needless to say, depending on the words said or unsaid, Strong and his staff had considerable ability to affect the interests of major powers. When I arrived, Strong was presiding at a staff meeting, sitting at the head of a long polished table in what had once been a gracious drawing room. He announced what he had done on his last round of travels. These achievements had to do with adding more pearls to the thread. He’d convinced Brazilian soccer star Pele to make public appearances. Former U.S. Democratic politician Bella Azbug was organizing women’s NGOs for him. Ted Turner had promised millions of dollars worth of coverage on CNN, guaranteeing the world would pay attention to the Rio Summit. We went upstairs to his office, a once comfortable library painted a weird shade of apple green. The bookshelves were almost empty…. He settled into his chair. I’m not sure what I expected of the man I at the centre of the story, but surely not this? His brown suit was rumpled, his hair white and askew. He was nondescript, of average height, average weight, with a small moustache, but his hands were huge- big enough to pull hot iron into shape. He coughed and coughed. He’d caught some form of pneumonia and had spent almost a month in bed back home in Colorado at the Baca Grande ranch. … His family were descended from United Empire Loyalists, who left he U.S. and settled first around Cobourg, Ontario, then made their way west to Manitoba to settle around Brandon. His father had worked for the Canadian Pacific Railway as a junior station manager; his mother was a doctor’s daughter from Estevan, Saskatchewan… Strong’s family was run over by the Depression when his father lost his job…. His mother died in a mental institution at age 56, killed by the Depression is how Strong saw it, a victim of economic devolution….. Strong became a socialist in a family of committed Liberals…. He also had family connections in the wider world of political action which he used later. Born on the U.S. side of the border a generation ahead of him were his distant cousins Tracy and Anna Louise Strong. The children of Congregationalist missionary based in Friend, Nebraska, their lineage went all the back to the men who had helped endow Harvard and Yale. Christian activist Tracy Strong became the director the YMCA’s Prisoner’s Aid committee during World War II and later the international program of the World Alliance of YMCA’s based in Geneva. Anna Louise Strong, his sister, was a Marxist and a journalist and possibly a spy, although for whom it is difficult to be certain. In 1921, she got into the new Soviet Union as part of a Quaker aid committee and got to know members of the emerging Soviet hierarchy, including Trotsky; she wrote about the new Soviet Union for the Nation and for Hearst International. She became a member of the Comintern (Communist International), later married the Soviet Union’s wartime deputy minister of agriculture (a man who was purged later by Stalin). During the period between the two wars she traveled in China, corresponded and dined with Eleanor Roosevelt, wrote in praise of President Franklin Delano Roosevelt’s New Deal. She was treated with deep suspicion by the FBI, who thought she worked for Stalin’s notorious spymaster Beria, but she also lectured at Stanford to U.S. intelligence personnel headed to China. In fact, she was flown to China by the U.S. Navy right after the war’s end. She spent two years with Mao and Chou En-lai in the crucial period leading up to the defeat of the Koumintang. When she returned, she carried secret messages from Chou En-lai. She was arrested in 1949 during a trip to the U.S.S.R. as an American spy. After Mao was victorious in China, she was denied her U.S. passport, and her association with persons in the U.S. State Department was listed as part of the grounds for her dismissals. Nevertheless, she managed to visit a nephew working in Mexico for the Rockefeller Foundation and visit Guatemala in 1954, writing in praise of President Arbenz. She returned to China during the Cultural Revolution and died there in 1970, a full-fledged Friend of the Revolution, her burial organized by Chou En-lai himself. In part because of his connections to Anna Louise Strong, the Chinese trusted Maurice Strong. (Strong) got his grade eleven in 1945, and in July, while the war still raged in the Pacific, he boarded the Hudson’s Bay Company’s schooner, the Fort Severn, at Churchill heading for duty as an apprentice fur trader at Chesterfield Inlet on Hudson Bay…. The Hudson’s Bay Company owned mineral rights to large stretches of the Canadian north. One of Strong’s tasks was to take the samples of minerals brought in by the Inuit and others and send them south. According to Strong, sometime during the summer of 1946, a big handsome man named Bill Richardson also arrived in Chesterfield Inlet…. It was Bill who introduced Strong to the world of oil, gas, big money, and geopolitics…. In the summer of 1947 Maurice Strong went to New York…. Where he was introduced to David Rockefeller, grandson to the man who’d made the oil business global. Rockefeller already had charge of the U.N. account at the Chase Bank. … Strong started work at the U.N., preparing accreditation cards and passes, on September 15, 1947. He met lots of famous people. Paul Martin saw him there. Strong met Andrei Gromyko, who made the speech for the Soviet Union in favor of creation of the state of Israel. When the U.N commission recommended that Palestine be split into the state of Israel, Gaza, and Jordan, it was a green light for joint venture oil partners like Socal and the Texas Company, which had exclusive oil concessions in Saudi Arabia. Two months after he arrived at the U.N., Strong quit, went back to Winnipeg, joined the RCAF, scrubbed out, and then became a trainee analyst at the brokerage firm of James Richardson and Sons. After oil was struck at Leduc, he became an oils analyst in Calgary. There he met Jack Gallagher who’d spent twelve years working for Standard Oil of New Jersey and its Canadian subsidiary, Imperial Oil. Gallagher had been hired by Dome Mines to build an oil and gas exploration company called Dome Explorations (Western) Limited…. Dome Exploration became one of the largest so-called independent oil exploration companies in Canada- but its controlling shareholders were embedded deep in Wall Street with ties to the family who started Standard Oil (Rockefeller). By 1951, Strong had married, bought a house, and gone to work at Dome as Gallagher’s assistant. In Gallagher’s memory, Strong was no genius; his most important characteristic was that he had a flexible mind. In 1952, Strong sold his new house, quit his new job, and travelled with his new wife around the world. His friends thought he must have made a fortune because prairie people, seared by the Depression, often could not bring themselves to walk away from any job. His friends knew he reveled in finding multiple virtues and uses for every course of action he took. Nothing was done for its own sake. When Strong arrived in Africa, the pre- and post-war colonial governance structures were crumbling and there was a struggle for power and market share among the major oil companies- British, French, and American. They were like bridgeheads for their governments. David Rockefeller was active in Africa: the Rockefellers had made a decision to do business with South Africa in spite of Apartheid, so that meant they had to mend fences among new African leaders as they searched for business opportunities in the newly emerging national states on the continent…. In Nairobi, Strong got a job with CalTex, the joint venture between the Texas Company and Socal to exploit Saudi oil. His job involved travel. He went to Eritrea, Zanzibar, Tanzania, Uganda, Mauritius, Madagascar, Zaire, a roll-call of places soon to be embroiled in the gilt-edged tyrannies of the Cold War. He stayed in Africa for a year. Then he and his wife hopped freighters home, passing through India, Sri Lanka (Ceylon), Hong Kong, the Philippines until they arrived back in Calgary in December 1954. Strong then tried to get a job in the Department of External Affairs: he was told that he couldn’t even apply without a university degree. So, he said, he decided to use business as a platform, a means to power. He never explained to me what he wanted this power for…. He seemed to understand early that power is augmented by influence spread throughout a number of networks. He moved rapidly into three. He not only went back to work at Dome, he also volunteered at the YMCA very quickly after his return, and by 1956 he was already so close to the federal Liberal Party, in the person of federal cabinet minister Paul Martin, that Martin regularly visited Strong’s house when he was in Calgary. The YMCA had a worldwide network that crossed Cold War barriers. It was one of the few Western organizations that maintained its facilities in Eastern Europe and mainland China. Strong also began to influence Canada’s foreign policy. As part of the thaw after the Cuban missile crisis the Rockefeller interests were pushing for, he led a Canadian YMCA group to the Soviet Union and brought Soviet youth back to Canada. In the summer of 1964, while Strong helped Prime Minister Pearson with the creation of the Company of Young Canadians, he also started to criticize the tiny department of External Aid. Fostering Third World development and U.S. business through foreign aid was also part of the Rockefeller agenda. … Soon the job of director general of external aid opened up: someone, it can’t be recalled who, told Prime Minister Pearson that Maurice Strong was just the man for the job. In June 1966, Strong left Power Corporation to become the director general of external aid, reporting to the minister of external affairs, Paul Martin… The same month he joined External Aid, he also became president of the YMCA of Canada. While working for the federal government in charge of Canada’s foreign aid program, he also pulled the Canadian Y out of its special relationship with the U.S. on the International Committee. … By 1962, the U.S. had also begun to use the new USAID to back nationalist movements abroad to counter communism. …. Since Strong had almost no staff at External Aid, he made a deal with SNC (now SNC-Lavalin), a Quebec-based engineering company, to offer “technical facilities” to External Aid in Africa…. SNC was also required to hire for the field anyone Maurice Strong wanted hired and no one Strong didn’t approve of…. One of the most successful projects was the construction of a series of microwave towers across north Africa. These towers permitted African countries to phone each other directly instead of running their communications through France (where they could be listened to). These odd arrangements between External Aid and SNC were the root for the government agency CIDA, the Canadian International Development Agency, which strong created in 1968 to replace External Aid. Before Strong had even finished the legislative framework for CIDA, Prime Minister Pearson, planning to retire, also dreamed up the International Development Research Centre (IDRC) a similar organization to CIDA but more loosely tied to the government…. Since IDRC was not created as agent of the Crown (as CIDA is), it was able to receive charitable donations from corporations and individuals as well as government funds Strong became its chairman- in October 1970. By the time Strong got the part in his story about how he used SNC as a private front for federal government skullduggery in Africa and Quebec it was Saturday afternoon. He had invited me over to his rented house in Aniers, a village outside Geneva. His house was a plain modern box with French doors opening onto a nice rolling lawn. We sat in his living room. He appeared relaxed. His second wife, Hanne Marstrand, drifted around. She showed little interest in this conversation about SNC and CIDA, as if she’d heard it all before, but it was news to me. I found myself sitting bolt upright. His meaning was quite clear. He had helped create a federally funded but semi-private intelligence/influence network that could have impacts both in Canada and abroad. He later confirmed this interpretation, although he said he had never described it that way before. I was shocked. It had never been acknowledged that Canada had a foreign intelligence or influence capacity outside its embassies. Yet Strong was telling me that he had created one of virtually nothing. There was no reason to suppose that this network wasn’t still running through CIDA and its cousin IDRC: I had reason to believe it was. It seemed to me that Strong and the federal cabinet got away with this semi-private intelligence/influence system because he’d hidden what he was doing in plain sight. CIDA, the successor organization to External Aid, made regular reports to Parliament and was audited by the auditor general. It was frequently excoriated for the absurd wastes of its tied-aid practices. CIDA may well be wasteful, but that is surely part of the point of the arrangement. Strong ran federal funds through a Quebec-based engineering company, which gave that group bankability and yet tied it to the federal power. Other Quebec companies also got a large cut of federal largesse through tied-aid programs, meaning the aid recipient had to purchase Canadian products and services. Meanwhile, Strong’s hand-picked people in Africa got private companies to hide behind. While the public works done abroad may not have given much benefit to the poor, they made foreign political actors happy. As Paul Palango would later suggest in his book, “Above the Law,” some Quebec political leaders were made happy too because they got a cut from these contracts as campaign contributions. Maurice Strong got information and could exert influence. The whole layered arrangement was also useful to more parties than the government of Canada. Who? Any group with heavy levels of investment or loans outstanding in Quebec who required continued political stability there- parties like the Chase Manhattan Bank (Rockefeller), like Empire Trust, which had just merged to become the Bank of New York, like the M.A. Hanna Company. Only four years earlier, M.A. Hanna Company had helped organize a coup to preserve interests in Brazil. Canada and Canadian investments were at least as important to M.A. Hanna as those interests in Brazil. …. (In 1969), Strong got a call from the Swedish representative at the U.N. The Swedes had pushed a resolution at the U.N. to hold an international conference on the human environment at Stockholm. Strong said he was asked if he would take over running it…. Strong’s appointment had always puzzled me. Given his history in the energy business, in he seemed never to have shown interest in the environment except as something to be used, why him? Strong explained that when he became active “in the international network,” he was seen to have some influence in developing countries. These developing countries, led by Brazil, were resisting the conference. As Senator Passarinho had explained, nationalists in the Brazilian military were convinced this U.N. environmental conference was part of a plot to grab Brazilian resources. The Swedes thought that Strong could deal with Brazil. … Strong, a federal civil servant, had certain private investments to take care of too. He had been involved throughout his tenure in government in real estate in Toronto through a company called Plural Properties (with Paul Nathanson) and another called M.N.S. Investments, which was one-third owned by former External Affairs Minister Paul Martin, one third by Nathanson and one-third by Strong. These companies had just taken over and reorganized a Toronto real estate company, renamed Y and R Properties. Strong put CIDA’s new director general of special advisers, John Gusave Bene, a war-time Czech immigrant to Canada, on Y and R’s board. Strong had recruited Bene to manage the special people he’d hired through SNC as they continued their work at CIDA. … Strong went to New York both as an undersecretary general of the U.N. reporting to U Thant and as the secretary general of the Stockholm Conference. Plaudits rained upon him: The New Yorker said he might save the world. He was made a trustee of the Rockefeller Foundation in 1971- a position he retained until 1977. The Rockefeller Foundation made a grant for the running of his Stockholm Conference office. He became a member of the Century Club and the Yale Club. He was handed the writing services of Barbara Ward, a British political theorist who promoted the virtues of the one-party states of Africa, and of Rene Dubos, a French ecologist who’d spent his life working at Rockefeller University. Around this time, and partly to service the Stockholm Conference, the government of Canada began its practice of funding NGOs. Previously treated as private organizations, charities and other groups opened themselves to the money and policies of the federal government- becoming, in effect, PGOs, private government organizations, while calling themselves NGOs, nongovernmental organizations… Canada put together a participatory task force to involve various Canadian environmental groups and business representatives in its delegation to Stockholm. Strong’s former protégé William Turner, by then president of Power Corporation, went to the Stockholm Conference as an NGO concerned with transportation. Why not? Power Corporation owned Canada Steamship Lines. Shipping owners were worried that there would be a convention signed at Stockholm to require the transport of oil in double-hulled ships. This is when Strong first demonstrated that the phrase NGO could be applied, like a democratic varnish, to dignify any group. This rubric could be applied to private organizations funded by government (PGOs); government organizations privatized (GOPs); three people meeting in a basement; or a highly organized business lobby. By calling them all NGOs, he dignified them as the vox populi. The Stockholm Conference may have also served as a cover for certain triangular reconfigurations of the global power map. In 1969, as Strong was invited to put he conference together, Canada and China also began to negotiate in secret at Stockholm the resumption of their diplomatic relations. This move also fit with the Rockefeller view of global affairs. … Strong found there was real scope at the U.N. for anyone with his skills. He could raise his own money from whomever he liked, appoint anyone he wanted, control the agenda. He told me had more unfettered power than a cabinet minister in Ottawa. He was right: no voters had put him in office, he didn’t have to run for re-election, yet he could profoundly affect many lives. Just as he had done at Power Corporation, he used the U.N. as a public platform from which to promote certain ideas. Barbara Ward and Rene Dubos co-wrote “Only One Earth,” a paeon to the idea of globalism. They published it themselves and stuck a U.N. logo on it…. As the Stockholm Conference opened in 1972, Strong warned urgently about the onset of global warming, the devastation of forests, the loss of biodiversity, the polluted oceans, and the population time bomb. He suggested a tax on the movement of every barrel of oil and use of these funds to create a large U.N. bureaucracy to blow the whistle on pollution wherever it was found. As I read this old speech, I realized it could almost be repeated at the Rio Summit. How could the same issues be on the table twenty years later? After Stockholm, some Western countries followed the U.S. lead and set up new departments of the environment and passed laws and regulations. Environment issues became part of various national governments’ administrative frameworks. The public process of environmental impact assessments in the U.S. became identified in the public mind with a new meaning of democracy- the right of affected parties to group together and be heard before public land use decisions are made. The other by-product of the conference was the creation of the new U.N. bureaucracy, the United Nations Environmental Program (UNEP). Like so many of the organizations Strong has made, this one too had multiple uses. In 1974, UNEP rose out of the undeveloped soil of Nairobi, Kenya, Strong’s old stomping ground. Placing UNEP in Africa was explained as a sop to the developing countries, who had been suspicious of Western intentions. But it was also useful for the big powers to have another international organization in Nairobi. After the Yom Kippur War in 1973, Nairobi became the key spy capital of Africa. Strong became UNEP’s first executive director. Right after the Yom Kippur War, OPEC raised prices 70 percent and placed an embargo on those states that sided with Israel. When (oil) supply was curtailed by major oil companies to the eastern half of Canada at the beginning of winter, to alleviate public concern and suspicion of oil company motives, Pierre Trudeau’s minority government announced its intent to create a national oil company…. On January 1, 1976, Strong became the first chairman and CEO of Petro-Canada. He also returned to the chair of IDRC. Within a month of startup, Strong hired Doug Bowie… as vice-president/environment reporting direct to Strong, no intermediaries…. Bowie found Petro-Canada was able to go places U.S.-owned private oil giants could not easily enter- such as the disputed area in the sea between Vietnam and China. In spite of the new conflict of interest guidelines, Strong quickly braided layer on layer of public and private interests. He remained for a time both a trustee of the Rockefeller Foundation, chair of the IRDC, and chair of Petro-Canada… He also set up a number of new private business ventures… In February, 1976, a month after he started work as chairman of Petro-Canada, he contacted Bill Holt, an accountant introduced to him by a former Empire Trust executive in 1971. Strong invited Holt to manage his continuing partnership with Paul Nathanson. A new entity called Stronat was registered in Alberta in April, 1976. The first deal Strong asked Holt to manage was to purchase the control block in Commerce Capital Corporation, an entity that originated as M.N.S. Investments, owned by Strong, Nathanson, and Senator Paul Martin. Holt arranged a Royal Bank loan, closed the $10-million deal in ten days, and then Stronat resold the control block immediately. Stronat then joined with Ken Rotenberg of Y and R Properties in Toronto to create the Rostland Corporation. Holt and Strong sat on Rostland Corporation’s board. …. Around the same time he organized the purchase of the control block in Commerce Capital Corporation, Bill Holt had also been asked to set up a company fist called China Ventures and then SinaCorp with a Toronto marketing expert, Harvey Kalef. The China Travel Agency (owned by the Chinese government) had offered Kalef exclusive rights to distribute products made by China’s state industries. After touring China, he’d decided to purchase such goods and then resell them abroad. An accountant he knew suggested he go and see Maurice Strong, who had both access to capital and a sentimental attachment to China because an aunt of his “had walked with Chairman Mao.” Stronat put up $2 million as SinaCorp’s working capital. Kalef was to manage the project. In November 1976, about the time of the election in Quebec and during the dangerous power vacuum in China, Kalef’s chartered Japan Airlines 747 took off from China loaded with jade, antiques, rugs, gold jewelry, and furniture and flew to Los Angeles. There Kalef had rented space to sell goods in the new Pacific Design Center. Those things he did not sell he packed on a plane sent on to Toronto. That same month, Jian Qing was arrested (in China), and the Gang of Four was crushed. In January, to his surprise, Kalef was told Stronat was closing down the venture, that he was no longer needed. In Strong’s recollection, he closed the business because Stronat lost money: Kalef had bought too much and paid too much. Strong was particularly rueful about a huge supply of gold chains that no one seemed to want. Strong said he had them melted down into gold bars and sold into a rising commodity market. I later put it to both Kalef and Strong that it appeared to me their venture had to do with someone trying to move their capital out of China in the lull before the storm. No, no, said Kalef, it had been planned months before Mao’s death. Not the case, said Strong, we dealt with state companies and not individuals. I should have remembered that as usual with Strong, this China venture had extraordinary flexibility. There was a great deal of room for the satisfaction of many interests. For starters, cash went into China, a low value restricted currency zone, and goods moved outside where they again be converted into a strong currency. Strong had said Stronat had lost money. That meant those running the state companies in China must have ended up with an extraordinary gain. It is interesting to note that not so long after these events Power Corporation of Montreal began to negotiate with state corporations in China: these early negotiations paved the way for important developments more than a decade later. I sat enthralled in Strong’s living room. I had come to Geneva to solve the puzzle of who Strong is, whose interests he represents. Now, instead of holding in my hands a neat explanation, I was on the edge of falling into his immensely complex, layered world. The NGO story was part of a business story, the business story was part of a political story, and all of them were pages from a book about the Cold War. Maurice Strong was a Rockefeller man, a Liberal man, a businessman, a man with relations to those at the top of the crumbling East bloc, a bridge between so many different centers of power. In 1977, while Strong was still chairman of both Petro-Canada and the IDRC, he also caused Stronat, his partnership with Paul Nathanson, to invest in agribusiness in the U.S. Dr. Carroll Wilson had introduced him to Scot Spangler (Harvard MBA), who had spent time in Africa working for the new governments of Tanzania and Uganda. Spangler then ran a Texas-based company called ProChemCo. He wanted to take over a larger public company called AZL or Arizona-Colorado Land and Cattle Company. AZL, a conglomerate, owned other companies active in feed lots, land, oil and gas, engineering. It even owned a commodities trading house and a bank. One of its ranches was the Baca Grande in Colorado. Stronat, a private multinational octopus, purchased control of ProChemCo. through various entities it controlled in Texas, Bermuda, and the Netherlands-Antilles. The corporate name was changed to Procor. In February 1978, it bought an AZL convertible debenture worth $10 million. It gave AZL a two-year option to buy Procor for the same amount. Strong, Hold, and Spangler were so welcome at AZL they were invited to join its board before this deal closed and without actually owning any shares. Strong became chairman of the executive committee. Why this extraordinary welcome to people who owned no shares? Strong explained that AZL rolled out the red carpet for him because of this little problem AZL was having with Adnan Khashoggi. Strong claimed his role was to keep Khashoggi off the board of AZL. Khashoggi had been the biggest shareholder of AZL since 1974. One of his executives had been on a the board until 1975. With Khashoggi’s help, AZL had entered a number of deals in Iraq, Egypt, and Sudan, often through the head of state of those countries. As has been detailed in a number of books, Adnan Khashoggi is another man of layered influence- an arms dealer/representative of Saudi Arabia, he has had relationships with a number of intelligence agencies. In the 1970s Khashoggi brokered vast arms purchase arrangements between Saudi Arabia and corporations of the U.S. defense establishment. At the same time, he enjoyed private business partnerships with members of the Saudi royal family, who were also officials of the Saudi government. In 1975, as a byproduct of the Congressional investigations of illegal foreign and domestic campaign contributions, the Securities and Exchange Commission wondered if Khashoggi’s huge sales commissions could actually be a clever means to pay bribes by U.S. corporations to foreign officials. When the SEC tried to serve a subpoena on Khashoggi’s executives in March 1976, he left the U.S. and did not return until October 1978. It’s difficult to understand why Strong would be needed to keep Khashoggi off the board of a publicly traded U.S. company while Khashoggi was so busy avoiding an SEC subpoena. Nevertheless, Strong insisted, there was pressure on him to let Khashoggi in the door. Strong and his future wife, Hanne Marstrand, first met with Khashoggi at Khashoggi’s brother’s house in London. Strong also met Khashoggi at Khashoggi’s own apartment in New York’s Olympic Towers. More often, he met with Khashoggi’s brother to inform him about AZL since Khashoggi continued to be its biggest shareholder. … By the summer of 1979, as a rolling wave of panic drove the price of oil from $13 to $34 a barrel, Strong had started a new international energy company, International Energy Development Corporation, S.A., or IEDC. He said it was designed to help the Third World cope with these new energy conditions by searching for oil and gas in their own territories. He based the company in politically neutral Switzerland, which required an act of the Swiss parliament since he is not a Swiss citizen. The partners of IEDC were AZL, Sulpetro, Volvo Energi, Sheikh Al Sabah, who was Kuwait’s finance minister and head of the Kuwait Petroleum Corporation; the Arab Petroleum Investment Corporation. Staff included a former Algerian politician and director of OPEC and the former worldwide vice-president of exploration for Exxon. IEDC paid license fees to explore for oil and gas in places like Angola, Mozambique, Chad, the Sudan- and even Australia. It was in the fall of 1979, around the time the Parti Quebecois announced their plans to hold a referendum on the future of Quebec, that AZL’s business got really complex. In October, AZL began the actual purchase of Procor, the first step in a series of maneuvers that resulted in a global version of Power Corporation. By April, AZL had bought Procor and converted its AZL debenture into common shares of AZL Only then did Strong and Nathanson actually own AZL, though they’d been directing it since 1978. In May 1980, Strong also joined the board of a publicly traded Swiss company known by the acronym Sogener. It was chaired by Leonard Hentsch, Strong’s banker friend from the Y network. Strong became Sogener’s executive committee chairman. He moved control of AZL to Sogener, and thus Sogener became the dominant but unseen partner in IEDC. Why? What was Strong up to? Some answers lay in the nature of Sogener and its reach into various corners of the globe. Like a Swiss-French version of SNC, its engineering divisions contracts were in mainly in Africa, in Angola and Libya. Sogener had just sold this engineering division to a Greek shipping magnate named Latsis, a friend of the Saudi King, Fahd. Sogener had done this transaction under the direction of Michel LeGoc, a man with his own very special political connections. Formerly a high French defense official, in 1960 LeGoc had left the French government and formed a mergers and acquisition company called Interfinexa with backing from important banks in Paris and Geneva. Sogener had cash on hand when Strong joined its board. By then LeGoc had already found a takeover target for Sogener- Credit Immobilier, a publicly traded company active in real estate finance in both France and Switzerland. On Credit Immobilier’s board sat jean Pierre Francois, said to have served with the Resistance in Lyons in World War II along with Francois Mitterand’s lawyer, Roland Dumas…. Francois owned shares in Credit Immobilier and voted the shares belonging to others. After lunch with Maurice Strong, he agreed to sell the control block. LeGoc made sure Francois later got a legion d’honeur. A circular transaction ensued. Credit Immobilier bought Stronat while Stronat borrowed to buy the control block in Credit Immobilier. When this complex deal closed, Credit Immobilier paid out Stronat’s loan and raised a further seventy million Swiss francs in a public offering. Paul Nathan died in New York in the fall of 1980, leaving control of this huge transnational conglomerate, loaded with cash, in the hands of Maurice Strong and John Wanamaker, Strong’s friend and Nathanson’s executor. This private/public leviathan sprawled across many national boundaries and through many jurisdictions, with directors on its various boards who were also active in foreign governments. Strong and his colleagues had created the capacity for global arrangements. This capacity was tested even as it was being formed. In February 1980 the Canadian federal election returned Pierre Trudeau and the Liberal Party to power. Right after the referendum in Quebec in May, 1980, the new Liberal minister of Energy, Mines and Resources, Marc Lalonde, decided Petro-Canada should buy Petrofina Canada, a Quebec-based firm owned in Belgium. Chairman Bill Hopper talked to Petrofina Canada. He was rebuffed. In June, Strong was asked to act as an intermediary between Petro-Canada and Petrofina SA, the Belgian parent of Petrofina Canada. Strong said Hopper asked him because he knew the Petrofina directors in Belgium, “particularly Baron Leon Lambert” whose Banque Bruxelles Lambert owned Petrofina shares and like Francoise voted the shares of others. The baron, a Rothschild, was “elegantly dissolute” according to Strong, who had met him years ago at Lehman Brothers Kuhn Loeb in New York. Petro-Canada’s actions were to be kept a dark secret from Petrofina Canada’s board in Montreal, said Strong; that is why Strong asked Hentsch to make the first contact in Belgium through Sogener, whose board Strong had just joined. It was all a matter of cover. After Hentsch made his approach to he Belgian chairman, Strong then talked to Lambert. The share price of Petrofina Canada began to soar. In November 1980, a Montreal newspaper claimed Petro-Canada would soon pay $120 per share for Petrofina Canada. Denials flowed. Unfortunately, when the $1.46-billion deal was announced in February 1981, that’s what the price turned out to be. Three provincial securities commissions announced a joint insider trading investigation with the federal Department of Consumer and Corporate Affairs. There had definitely been insider trading. The chairman of Petrofina Canada and other top executives had created a stock option plan in June 1980 after Petro-Canada made its first offer. They had bought shares cheaply and sold them dearly as the market rose on rumors. The top executives at Petrofina Canada insisted they had acted without knowledge of the coming offer. It was soon learned that Sogener had earned a fee of almost $1 million for its services to Petro-Canada and that former Petro-Canada chair Strong was chairman of Sogener’s executive committee. There was a hue and cry. Strong said he urged the investigators on in their work and gave his earnings to a non-profit created by Barbara Ward- the International Institute for Environment and Development. In December 1981, the federal government published the results of its investigation without waiting for the provincial securities commissions. It stated that no one had improperly traded on inside information. The report did not point out that it was then neither improper nor illegal in Belgium or Switzerland to trade on inside information…. Much later Power Corporation bought control of Baron Lambert’s Banque Bruxelles Lambert: then it bought 40 percent of Petrofina SA. Maurice Strong took a battering over the Petrofina events, but Prime Minister Pierre Trudeau appointed Strong vice-chairman of the Canada Development Corporation (CDC) in 1982. CDC held the crown interest in a number of corporations. CDC was run by a former executive of Power Corporation, who had refused to buy the control block of the ailing Massey Ferguson company from the Argus group when asked to do so. While Strong bided his time, his friend Jack Austin, by then a senator and a member of the federal cabinet, created the Canada Development Investment Corporation (CDIC) to manage or divest all federal government holdings, including the recalcitrant CDC. In 1982, Strong became the chairman of this larger corporation, reporting to Parliament through Senator Austin. This was a privy council appointment. Nevertheless, Strong did not resign from his other private company interests. In the meantime, Iran and Iraq went to war: both pumped out ever higher volumes of oil to pay for arms and the price of oil fell. Of IEDC’s partners, only the Kuwaitis wanted to continue hunting for oil and gas in Africa. Strong looked for a company he could merge IEDC with. In May 1982, Tosco, a large California-based independent oil company, was paid $200 million in cash by Exxon as compensation when it pulled out of their joint oil shale project. Tosco became a predator’s opportunity. The Belzburgs’ First City group backed a Colorado man named Ken Good to begin a hostile takeover of Tosco. This started a chain of events which rapidly sheared Tosco of its asserts like a lamb in spring. Tosco’s chairman, Morton Winston, developed a sudden interest in international oil exploration. A French “internationalist” on his board had told him about Maurice Strong’s company, IEDC. Winston went to Geneva and told Strong he wanted Tosco to buy into IEDC. Instead, Strong said he wanted to merge his whole conglomerate with Tosco, which would entail Tosco offering cash to the shareholders of the various publicaly traded companied involved. The subsequent merger between Tosco and Strong’s leviathan was handled by an American lawyer based in Geneva named Warren “Chip” Lindner. Lindner was another man with interesting connections. He had been a partner in the huge Texas-based international law firm Vinson and Elkins. His partners in London had acted for Adnan Khashoggi and also helped Ghaith Pharoan, another well-connected Saudi, buy the National Bank of Georgia from President Carter’s budget director, Bert Lance. In 1980, Lindner left Vinson and Elkins to work in the office of the World Wildlife Fund International in Switzerland. He had no backgroun in environmental issues, his expertise was in energy finance, but he was hired as vice-president of policy to assist the head of World Wildlife Fund International There he met Maurice Strong, who was serving both as vice-president and on the board of World Wildlife Fund International. In November 1983, Tosco defaulted on $850 million in bank loans some but not all of which had been secured by preferred shares and notes of Tosco, junior to Strong’s Special Class A preferreds. These had been taken on to buy up Tosco’s own shares and other assets. Tosco’s share price had falled rapidly as the price of oil dropped. Apparently, the value of AZL, IEDC, and the previously cash-rich Credit Immobilier, Sogener, and son also went up in smoke. By 1984, just a year after the merger, Tosco wrote down its $100 million investment in Strong’s companies to virtually nothing. Assets previously described as being worth $100 million and paid for in cash, shares, and promissory notes were now described as worthless. The banks, a familiar group including Chase Manhattan, Credit-Lyonnais, the Bank of Montreal, and the Bank of New York, agreed to payment of their loans with shares and warrants, but insisted that the special preferred shares be taken out and insisted on a fire sale of the Tosco assets. Strong resigned from the Tosco board and exchanged his preferred shares for common shares which he sold on the market for about $5 million. Spangler set up First Phoenix Corporation (so aptly named) and proceeded to buy back from Tosco at bargain prices some allegedly worthless assets. Strong and his Sogener associates bought back Credit Immobilier for $600,000 in cash plus the assumption of $29,475,000 of debt from Tosco or AZL to Credit Immobilier which was immediately canceled. Before he left Tosco’s board, Strong offered to buy AZL assets too. In October 1985, after Strong had left Tosco’s board, his First Colorado Corporation did buy the Baca Grande ranch and other AZL real estate and oil and gas assets from Tosco. Sam Belzburg was one of the investors along with Strong in First Colorado. First Colorado paid Tosco $8.2 million for these assets, including the 139,000-acre ranch which also encompasses two major mountain peaks. Underneath the ranch lies a huge aquifer whose water First Colorado hoped to sell for billions. After the Progressive Conservatives, led by Brian Mulroney, came to power in the fall of 1984, Strong resigned from the board of CDIC. He was busy with other things. In 1983, about the time Tosco defaulted, he had been appointed a member of the Brundtland Commission, the World Commission on Environmental and Development. He got his Sogener associate Chip Lindner a job as the commission’s executive director. The secretary general was a Canadian, Jim MacNeill, who would later serve as chair of a charity raising money for Strong’s office at the Rio Summit. Late in 1984, Strong also got a call from an old friend, former U.S. Republican Congressman, Bradford Morse, then head of the U.N. Development Program. Morse had been asked to organize the relief effort to save thirty million people on the brink of starvation in sub-Saharan Africa. He needed Strong’s help. He had cut a deal with Mengistu. He had long since given up on the idea of converting others to the Good. He’d learned to identify actors and their motives and them onside. If he had succeeded in Africa, it was because he had done his homework. He knew what Megistu wanted. At the end of December 1986, Strong was asked to lunch with the new Swedish Prime Minister, Ingvar Carlsson. The Brundtland Commission was winding down, but an explosion at the Soviet nuclear power plant at Chernobyl had scattered radioactive materials all over Europe. (ETK note: Was the timing of this environmental disaster a coincidence? Indeed, the Chernobyl “accident” has been found to have been intentional.) At the lunch, Strong proposed a new United Nations conference on the environment to be held on the twentieth anniversary of the Stockholm conference. At first, Strong thought Sweden would host the conference. Then Canada put in a bid. Then, in April 1989, Brazil put in a bid too. Strong scouted Brazil to find out what the prospective president, Collor de Mello, thought about the issues. 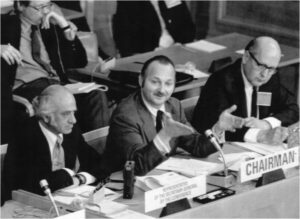 In the end, said Strong, it was the Brazilians who suggested that he, Maurice Strong, should be the secretary general of this conference. Once again, the Rockefeller and the Ford Foundations were generous helping Strong with the costs of his U.N. office. This money was given to a new charity set up in Washington, which doled it out. Some very large multinational corporations, including oil and chemical companies based in Britain, Japan, Switzerland, Italy, and the U.S. also put large sums of money into this kitty. Old associates of Strong like Jim MacNeill served on the charity’s board of directors. Strong did not divest himself of all his energy or resource holdings. Instead, his former protégé at Power Corporation, William Turner, voted his shares in Baca Resources, a publicly traded Alberta oil company he controlled. (It in turn controlled an oil and gas subsidiary of the same name in the U.S.) By this point Maurice Strong had become a figure above suspicion. A few days later, at his office, Strong popped candies to keep up his energy. I bounced in my chair across from him, interrupting, accusing. I was full of the conversations I’d had with others in Geneva. I was beginning to understand that the Rio Summit was part of a Rockefeller-envisioned Global Governance Agenda that dated back before World War II, that it was linked to the regional trade agreements just being negotiatied- the North American Free Trade Agreement and the Maastricht Treaty. Like the Stockholm Conference, it was all about integrating East and West. He was part of the push to remake the U.N. itself to fit a brave new unipolar world. He diverted my attention only briefly with talk about his lunch with the French who may have been appraising him as a candidate for secretary general. “So, what about it, are you a One Worlder?” I finally asked. Such a tax, he said, definitely would not be levied in the cause of world government. But, nonetheless, he was convinced that in not too long a time, world governance would definitely happen. “A century ago,” he said, “Garibaldi was seen as a completely unrealistic for saying Italy could be united, but it did happen. It can become tomorrow’s inevitability. It see it as inevitable- it’s unreal right now- but I do see it as a necessity.” He proposed that governments themselves move towards it, to pass an act to apportion to a fund- that sort of thing was in line with existing constitutional practices. He said this with a rockhard determination. I then understood that he hoped to get national governments to take the first and second and third steps in the diminution of their own powers at Rio. It was like hearing a distant trumpet sound outside the walls, a signal that a great work had begun. The Rio Summit, like the Stockholm Conference, was aimed at reorganizing the world into very much larger administrative units, with real power redistributed from national governments to vast regional organizations. The idea of relative sovereignty was going to apply to all nation states, not just environmentally sensitive places like the Amazon. The foundations for this had been laid years ago around the time Stockholm, back when it seemed the U.S., the U.S.S.R., and China could all come to at least a triangular agreement. That’s when the Rockefellers had first created their Trilateral Commission, an organization that configured the world in three economic zones- Europe, North America, and Japan. It became a kind of game for me to trace connections of the PGOs (private governmental organizations) trying to sell the Global Governance Agenda back to Maurice Strong. I was not surprised to learn that he and his wife Hanne Marstrand even had their own such organization, the Manitou Foundation. Hanne Marstrand is its president; Strong its treasurer. He made sure that Manitou Foundation was accredited as an NGO to the Rio Summit. Manitou was then asked to organize a spiritual meeting for the Rio Summit. Manitou Foundation’s various grant-making exercises include giving land to favoured groups at the Baca ranch. Various religious orders the Carmelites and Tibetan monks also have retreats at the ranch. Certain biological materials are stored there against any future depletions of the gene pool. Manitou Foundation was originally financed by $100,000 from Laurance Rockefeller and $20,000 from Robert O. Anderson, former head of Arco. It also received $1.2 million from the sale of Strong’s shares of American Water Development, Inc. (the company made to pipeline water from the Baca Grande’s aquifer) to his partners in First Colorado Corporation. Later, Manitou also got $21,500 from the charity set up to Strong’s Summit office. (At U.N. headquarters. Hanne) Marstrand had flown in from the Baca Grande that weekend for the start of the preparatory conference. Marstrand had a talent for New Age spirit matter, an ability to roll up her sleeves and plunge publicly into the latest of most ancient of cultural forms. A Tibetan lama who died in her living room stayed unmoved for the requisite number of days until his well-trained spirit actually left his flesh. Marstrand was familiar with sweat lodge ceremonies of American Indians; she was convinced of the power of crystals and intrigued by the prophecies of neighbors. These interests made her attractive socially to people like Shirley MacLaine and J.J. Ebaugh, Ted Turner’s pilot. Strong and Marstrand have a kind of partnership based on separate talents. Maurice Strong is a genius of arrangements; Marstrand tends the vineyards of the soul. … Working groups were meeting on two floors, most with their doors open, one closed. No one would say what the group behind the closed door was deliberating, nor would they say why one could not enter. I slipped into a press chair in another room in time to hear a British delegate complain about Strong’s Agenda 21 document.